Following the review of extensive medical evidence, the U.S. Preventive Services Task Force has generated recommendations that include guidelines expanding routine screening for osteoporosis to all women aged 65 and older. The task force also recommends osteoporosis screening for younger women with increased risk factors for bone fractures. The panel’s new report estimates that 12 million Americans over the age of 50 will likely develop osteoporosis by 2012. More than one-half of all postmenopausal women will develop fractures related to osteoporosis during their lifetime, including 15% who will suffer a hip fracture. Hip fractures specifically are associated with chronic pain, disability, loss of independence, and an increased risk of death. The new guidelines recommend that physicians and policymakers examine the evidence underlying the panel’s recommendations. And it’s also critical for physicians to tailor screening and treatment decisions to patients’ personal conditions and situations. Studies indicate that managing osteoporosis effectively pays dividends in terms of reducing both the number of fractures and the overall costs. “In general, physicians can do a better job with osteoporosis screening, prevention, and treatment to help the quality of our patients’ lives and even decrease mortality,” says Aurelia Nattiv, MD, a professor in UCLA’s departments of orthopaedic surgery and family medicine and director of the UCLA Osteoporosis Center. She suggests physicians remain attuned to their patients’ potential risk of osteoporosis and make appropriate screening recommendations. “Since osteoporosis is a silent disease, some physicians do not remember to recommend screening appropriately in their patients, such as if the patient sustains a low-impact fracture,” Nattiv says. These patients should be screened, she notes, and most should be treated for osteoporosis following such a fracture. “Low-impact fracture is one of the greatest risk factors for future fracture,” she adds. Siris also recommends that clinicians use FRAX, an online fracture risk assessment tool developed by the World Health Organization, which is especially helpful in evaluating the risk of fractures for postmenopausal women (and older men) with osteopenia. The algorithm combines bone density value at the hip with a number of risk factors predictive of a patient’s 10-year probability of a fracture. Also entered into the FRAX equation are factors including a patient’s height and weight, rheumatoid arthritis diagnosis, previous fractures, cigarette and alcohol use, and history of parents’ fractures. The results help physicians assess the risk of hip fracture as well as major osteoporotic fractures. “FRAX has been used as a way of looking at someone’s 10-year risk of fracture to aid in treatment decisions,” says Siris. The National Osteoporosis Foundation states that FRAX calculations of 10-year risk of 3% or higher for hip fracture or 20% or higher for major fractures should prompt treatment recommendations. There is a limited downside to osteoporosis screening. Some patients may be incorrectly diagnosed with osteoporosis if they go to a center where the physicians and technicians are not adequately trained in bone density assessment and interpretation, according Nattiv. “It is important for patients to go to a reputable [screening] center,” she says. Nattiv also mentions that there is a small amount of radiation involved with DXA scanning, but it is much less than a conventional x-ray such as that of the knee or a chest x-ray. The new guidelines aim to identify patients at risk of a fracture and suggest therapies to prevent bone fractures due to osteoporosis, such as adequate calcium and vitamin D intake, weight-bearing exercise, and a number of approved drug therapies. “What they’re trying to do is utilize precious healthcare resources in the most cost-effective way,” says Siris. The severity of low bone density and overall fracture risk determine patients’ treatment options. Pharmacologic treatment of osteoporosis lowers the risk of future fractures very substantially, according to Siris. However, choosing the appropriate treatment for each patient remains a significant challenge for many providers. “There’s a lot of clinical judgment involved. We have a range of treatment options and providers need to choose the right one,” she says. With any osteoporosis drugs, there needs to be careful monitoring to determine whether the drug is effective and whether patients are adhering to the medication regimen. In some patients, pharmacologic therapy with the class of bisphosphonate drugs may be discontinued after five years of continuous use, according to Nattiv. “This is to reduce the risk of potential complications that have been noted in a small percentage of patients on long-term bisphosphonates, such as atypical femur fractures and jaw osteonecrosis, as well as some other possible complications,” she says. Siris emphasizes that side effects such as jaw osteonecrosis and atypical femur fractures are very rare. “In most cases of osteoporosis, the benefits of the medications outweigh the potential risks,” says Nattiv. In some cases, a diagnosis of osteopenia, a loss of bone density that’s less severe than osteoporosis, may respond to nonpharmacologic measures, with treatment involving medication therapies determined by the physician or osteoporosis specialist. “Not all cases of osteopenia need to be treated with prescription drugs,” she says. “The use of FRAX should help determine which osteopenia patients need treatment and which don’t,” says Siris. For example, in an older woman with osteopenia at the hip who has a history of a prior fracture, her risk of future fractures determined by FRAX may be elevated, and treatment would be warranted. In postmenopausal women who have risk factors for future fracture, a bone density test will identify women for whom treatment can prevent a first fracture. And the task force discovered convincing evidence that drug therapies, including bisphosphonates, parathyroid hormone, raloxifene, and estrogen, reduce the risk of osteoporosis-related fractures. 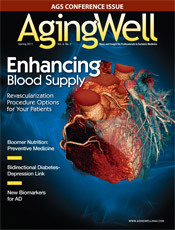 — Barbara Worthington is editor of Aging Well.